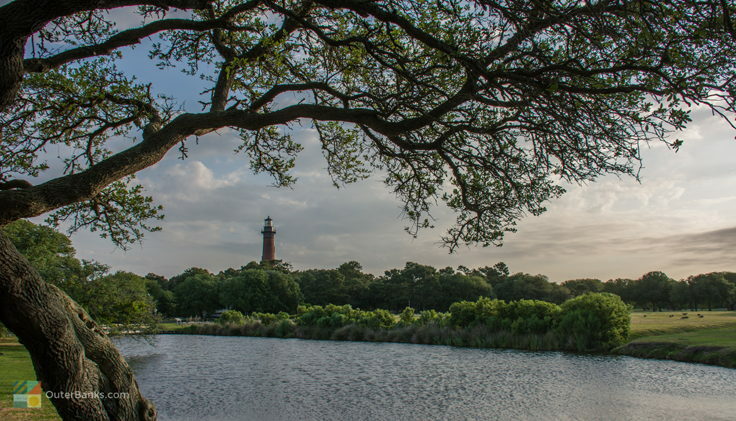 Whether you are climbing 214 steps to the top of the lighthouse for a panoramic view, or just taking the kayak or small skiff out for a soundfront spin, there are endless ways to enjoy this completely picturesque park. A relic from Corolla's original elite hunting visitors, this park has been masterfully maintained to the delight of thousands of modern vacationers. If you're planning a visit to the northern Outer Banks, then this locale is a must for anyone in your group who loves history, scenery, or just a gorgeous day out on the water. While the sprawling 39 acre site gives visitors ample room to spread out and explore, this parcel of land is actually small in comparison to the original tract which was owned by some of the area's first visitors, and patrons, Edward C. and Marie Louise Knight. At the time, elite and stunningly built hunt clubs in rustic regions were all the rage, and so the Knights set out to build their own multi-million dollar hunt club in the small town of Corolla. They purchased a four square mile tract, which spanned from the Atlantic Ocean to the Pamlico Sound, and spent the better part of the mid to late 1920s creating their dream estate, The Whalehead in Historic Corolla. Even among the best hunt clubs, the 21,000 square foot home was especially incredible, with Art Nouveau architecture, (a very popular style at the time), and nature-inspired themes. Close to the Pamlico Sound, and featuring endless rooms for their elite gests to congregate and enjoy, the Whalehead in Historic Corolla became a beacon for the Knights' wealthy colleagues, and the town of Corolla's popularity gradually grew among the wealthy. Unfortunately, the Knights didn't enjoy their Outer Banks retreat for very long, and both passed away in 1936. In the years that followed, the Whalehead in Historic Corolla and the land around it sat empty, until an interested party bought the entire 4 mile property for the whopping sum of $25,000. The original tract dwindled over the decades, with developers or private owners picking up certain portions, leaving the 39 acre parcel which remains today, and is open to the public. But one could easily argue that the parcel that remains, managed by the Whalehead Preservation Trust, is by far worth its weight in gold. Home to some of the prettiest landscapes in all of Corolla, with three major attractions located on site but a significant distance away from each other, the Historic Corolla Park remains an inside look into the area's rich history as a wealthy tourism destination. As noted, the Historic Corolla Park comprises 39 acres of gorgeous soundfront and soundside property, but this simple geography only tells half of the story. Look at a map or an aerial view of the property itself, and you will see parcels of lush green, well-manicured grounds bordered by small clusters of maritime forest, and abutting saltwater ponds, canals, and the wide open Currituck Sound. 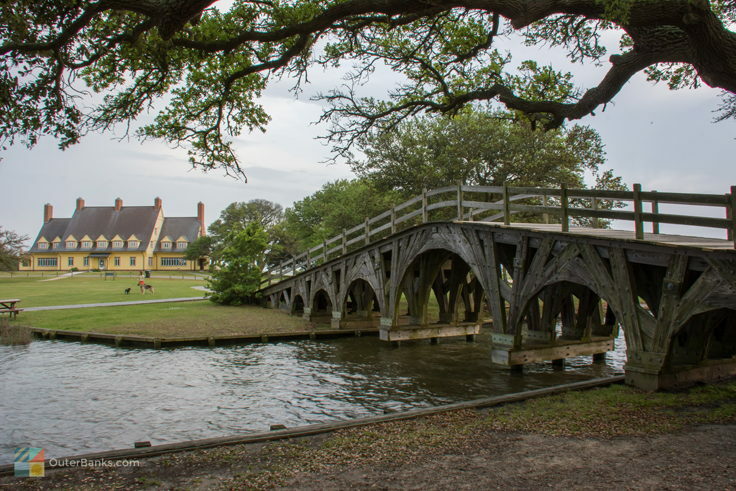 The famous Whalehead in Historic Corolla is located close to the center of the property, seemingly standing guard over the scene, while small ponds and canals surround the historic structure. In the middle of the property, visitors will find the largest of these "ponds," which includes a boat house, small docking stations for visitors launching or arriving via a kayak or skiff, and a small canal that leads out to the sound. The area surrounding this saltwater pond and the Whalehead in Historic Corolla itself is well tended, with acres of lawns that are ideal for a picnic basket, a Frisbee, or a lawn chair and a good book. 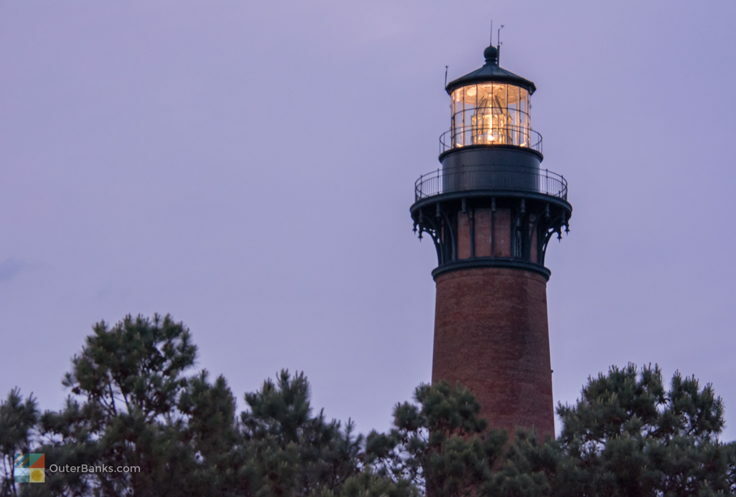 On the northern end of Historic Corolla Park, visitors will spot the Currituck Beach Lighthouse peeking out over a line of cedars and live oaks. This northern parcel is wooded, with several trails that line through the marshy areas and eventually lead out to scenic sound boardwalks or vistas. 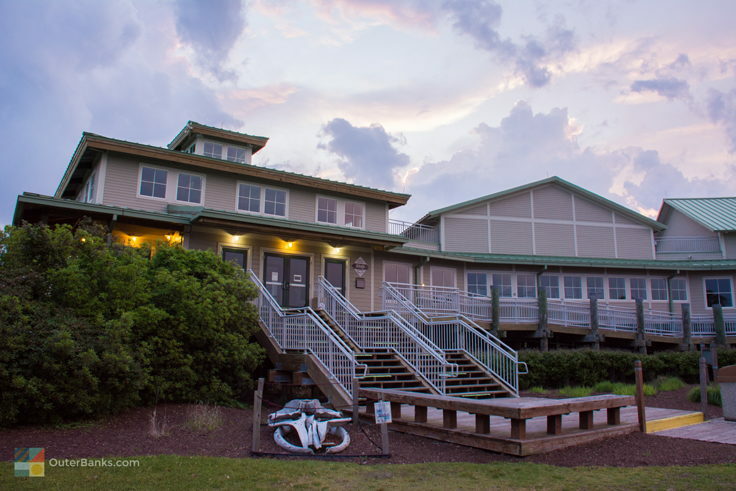 The Outer Banks Center for Wildlife Education is located at the southern borders of the maritime forest and marshlands, and is hard to miss with its conjoined complex of buildings that specialize in exploring the Outer Banks' fragile ecosystem. It may take a solid hour to do a self-guided tour around the grounds, without exploring the renowned Whalehead in Historic Corolla or Currituck Beach lighthouse, but the trip is certainly well worth it, and will most likely serve as a launching point for future Historic Corolla Park adventures. The Whalehead in Historic Corolla is arguably the most prominent attraction within the manicured grounds, and while the grounds themselves are free and open to everyone, the Whalehead in Historic Corolla itself is open for seasonal tours to visitors for a small fee. The custard-lemon yellow exterior with almost-black trim has become an icon for local artists and visitors, and many visitors have been inspired by its grandeur and rich attention to detail, from the small ornate fixtures along the exterior of the building to the authentic portraits of the Knights in the sitting room. Of course, with such a stormy past, the Whalehead in Historic Corolla also has its own treasure trove of legends and ghost stories, typical for an Outer Banks attraction of its stature, and visitors will enjoy hearing all the juicy details as they meander through room to room on a guided tour. 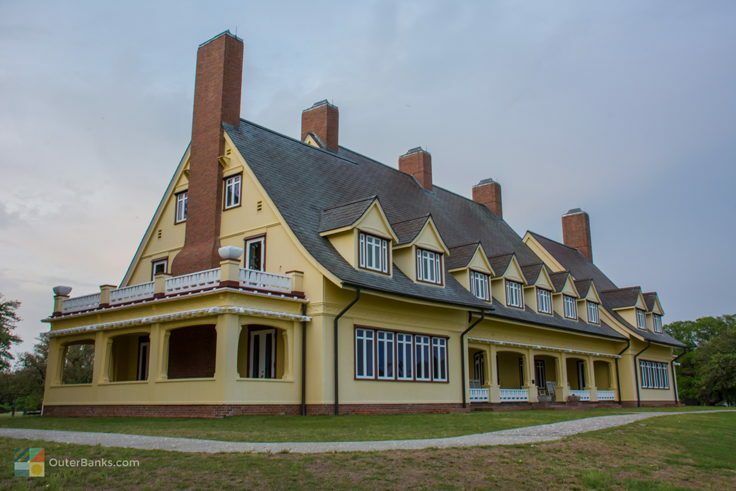 Generally open from spring until fall, a tour of the Whalehead in Historic Corolla is must for anyone who loves history, architecture, or just a little bit of good old fashioned Outer Banks gossip. The Whalehead in Historic Corolla and surrounding grounds are also available to rent for special occasions, including grand parties, receptions, and even world-class business conferences. For more information, visit the Whalehead in Historic Corolla's website, or simply inquire in person on your next visit. If anything can capture a visitor's attention away from the 21,000 square foot Whalehead in Historic Corolla, it's the Currituck Beach Lighthouse. The lighthouse is one of the most distinctive lighthouses on the Outer Banks, as it strays away from the standard black and white color schemes found in the other North Carolina barrier island regions, and sticks to its unpainted brick red exterior - a deliberate move during its original construction to make sure it was unique. This attraction was brought back to life by a $1.5 million restoration over 30 years ago, orchestrated by the Outer Banks Conservationists (OBC), and as a result, vacationers can enjoy the thrill of climbing to the very top and enjoying the breezes and the views, or just admire the lovingly maintained structure from ground level in all its glory. The lighthouse is open seasonally for climbers for a small fee, (generally from March until April), and visitors should expect to be a little winded after reaching the top, 162' feet above sea level. That said, the view is nothing short of spectacular, and even guests who forego the hard climb will find plenty to discover within the park's grounds, including a small museum and gift shop and the authentic lighthouse keepers' quarters, located throughout the grounds. The Outer Banks Center for Wildlife Education is located in the middle of the Currituck Beach Lighthouse and Whalehead in Historic Corolla attractions. This center welcomes guests to the natural Currituck landscape with countless attractions and exhibits, just waiting to be explored. Take a tour through the 5,000 square foot exhibit hall, filled with displays and artifacts that focus on the extensive cultural and natural history of Currituck. Visitors will also be amazed by the 8,000 gallon aquarium tank that is home to a number of local fish and species, and represents an accurate slice of the Currituck Sound environment. With more than 250 examples of waterfowl decoys, and a life-sized representation of a duck-blind in a local saltwater marsh, visitors will find ample ways to delve a little deeper into the natural Currituck Banks environment. The Center for Wildlife Education is open every day except Sunday, from 9:00 a.m. until 4:30 p.m., and is closed on major holidays. Admission is free, and the center even features an NC Wild Bird Store for local gifts, art, and apparel to take home after your visit. Keep a lookout for special seasonal programs, offered to both young and adult visitors, which are sure to enhance your entertaining education of the delicate soundfront habitat. The Historic Corolla Park also features four year-round nature trails that are open to visitors and provide a fantastic exploration of the quietly serene soundside environment. Take a leisurely stroll through condensed thickets of live oaks, pine trees and cedar trees, or explore the dense saltwater marshes that are flanked by patches of sea grass and a number of migrating and full-time shorebirds. The majority of these trails will lead you right to the Currituck Sound, and some spectacular sound or sunset views, providing a perfect capper to a little soundside exploration. Watersports lovers of all kinds will also love a trip to Historic Corolla Park, as the small ponds and canals leading out to the sound provide some spectacular launching points. Visitors are welcome to bring their kayaks or small shallow draft boats to the park's edge and shove off for an in-depth sound exploration, or simply lounge away an afternoon by the ponds' edges with their toes in the water. Bring along your soundside fishing poles and crab pots, as these waters are also ideal fishing grounds for anglers who want to try something different from the oceanside surf. Joggers and strollers have also been known to frequent the area for its scenic walking trails, and romantics should pack up a picnic basket before sunset to enjoy a nice, private celebration of a lovely Outer Banks vacation. Regardless of what attractions you choose to visit first, chances are you'll be back again and again to the Historic Corolla Park during your Corolla, Carova or Duck vacation. With limitless ways to have fun and major area attractions to explore, this destination deserves at least a full day of vacation time to explore properly. Remember that worst case scenario, you can always book a second trip to the Outer Banks to fit it all in. Historic Corolla Park holds a number of fantastic seasonal events, ranging from weekly summer wine festivals to 4th of July celebrations, and Corolla and northern Outer Banks vacationers are encouraged to check out their calendar here to see what exciting events are taking place during their stay. Enjoy a quiet outdoor concert while stretched out on the lawn, or enjoy an Outer Banks-style holiday with the two-day Christmas in Corolla event. The Historic Corolla Park always seems to have something on the agenda to appeal to vacationers of all kinds. In the summer, the park is known to have seasonal weekly events that guests can enjoy regardless of when they come to the Outer Banks. These events include a summer concert series, wine or beer tastings, or special tours of the Whalehead in Historic Corolla, soundside grounds, or other locations. Guests can inquire in person to see what upcoming informal events are planned, and are encouraged to stop by the park grounds in the evening, especially on weeknights, when the summer activities are typically in full-swing. 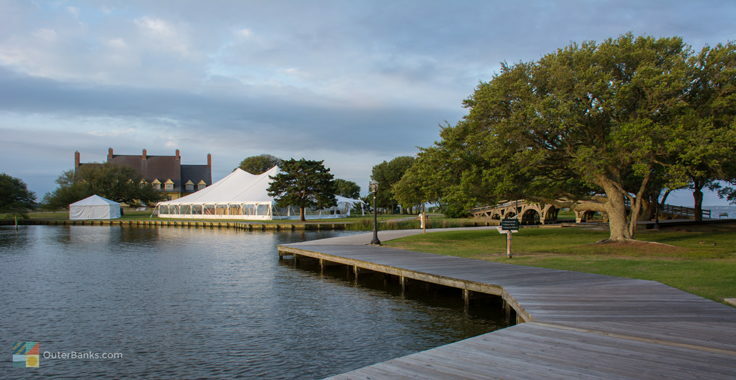 For Historic Corolla Park patrons who are planning their own special event, like a wedding or reception, the grounds make ideal backdrops for ceremonies, casual receptions, or even photo sessions. Be sure and contact the Whalehead Preservation Trust in advance to reserve any grounds for a special event, such as a wedding. Picnics that are more than 15 people should also check-in with the park for any needed permits or permissions, as well as any professional photo shoots that require extensive use of the grounds. However, visitors will find that scheduling and planning a special event on the Whalehead in Historic Corolla grounds, or any of the Historic Corolla Park grounds for that matter, is a relatively easy affair that will lead to some truly spectacular events that guests will remember warmly for a lifetime. While the Historic Corolla Park is open to the public, there are a few rules and guidelines that visitors should bear in mind. Boats are welcome at the park, but can only be docked for up to 24 hours. In addition, the boat ramp is closed from dusk until dawn, year-round, and swimming near the boat launch is not allowed due to the safety risks. Fireworks are not permitted on the premises, and pets are welcome but need to be leashed at all times. Loud music and alcohol are also prohibited, unless they are part of a scheduled special event. For a complete list of local rules and regulations, visitors can visit the Currituck County's website, or simply ask a staff member while on the premises. Visitors who plan to explore the intricate network of nature trails by the marshy areas or the maritime woods should bring a little bit of bug spray. These areas are known for their mosquitos, particularly in the summer months, and during the summer and shoulder seasons, a little bug spray can keep a quiet stroll an enjoyable venture. Be sure and keep an eye on the local calendar for upcoming special events. The Historic Corolla Park sponsors a number of locally renowned celebrations, including a 4th of July event that is capped off with waterfront fireworks, and the annual Wild Horse Days, a celebration of the wild mustangs that have called this region home for centuries. Chances are, there are some spectacular events going on during your vacation week which will most definitely be worth a look. Want the experience of being a 1920s millionaire? Then try visiting the Historic Corolla Park in the off-season. During the cooler and unpopulated months of December, January and February, the park is all but deserted, giving visitors ample private access to explore the grounds. While the major attractions may have closed up shop for the winter, you'll surely feel like a Rockefeller strolling over the small canalfront bridges, or enjoying a picnic on a deserted stretch of well-tended grassy lawn. Don't forget the kayak, skiff or the stand-up paddle board. The Historic Corolla Park offers free launching access for water sports lovers of all varieties, as well as an easy route to the open waters of the Currituck Sound, For a self-guided exploration of the soundside, bring along the boards or the boats, and enjoy an easy platform to viewing the best of the soundfront scenery. Virtually every Corolla or northern Outer Banks vacationer will spend a little time exploring the Historic Corolla Park, and will most likely come back for more. As the permanent home to three of the area's most visited attractions, in addition to acres of soundside beaches and grassy lawns to explore and enjoy, this park has become world famous as one of the most scenic locations on the Outer Banks. Bring the family and spend an afternoon exploring the grounds, ending with a fantastic waterfront sunset. Whether your Historic Corolla Park adventures take you on a lighthouse climb, a Whalehead in Historic Corolla tour, or an extensive self-guided paddle along the Currituck Sound, chances are you'll be back again and again to try out a new adventure in this expansive and treasured Outer Banks landmark. What is Historic Corolla Park? 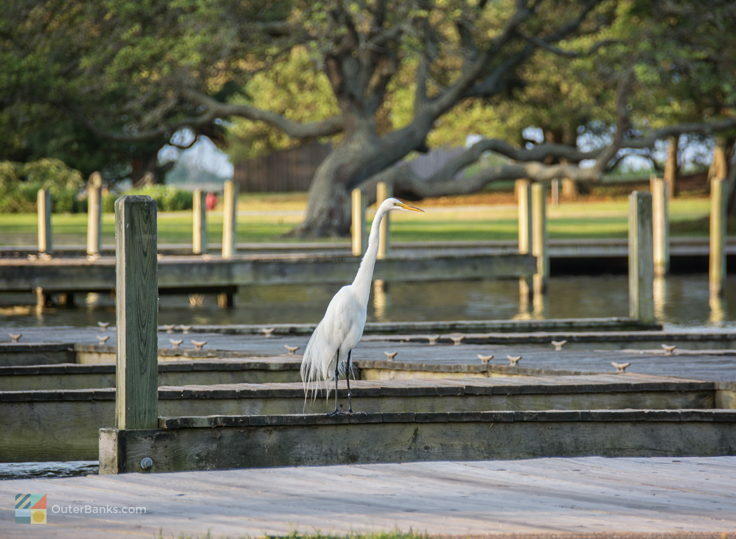 The Historic Corolla Park, also referred to as the Currituck Heritage Park, is a 39 acre park in the heart of Corolla that is bordered by some of the northern Outer Banks’ most beloved attractions, such as the Whalehead Club and the Currituck Beach Lighthouse. The park is a popular destination for fishing, watersports, picnics, and special outdoor events throughout the year. Where is Historic Corolla Park? Historic Corolla Park is located in the center of Corolla, and borders a number of popular landmarks including the Whalehead Club and the Outer Banks Center for Wildlife Education. It’s also a shell’s throw away from the Currituck Beach Lighthouse. How do you get to Historic Corolla Park? Visitors can take NC Highway 12 north to the Outer Banks town of Corolla. 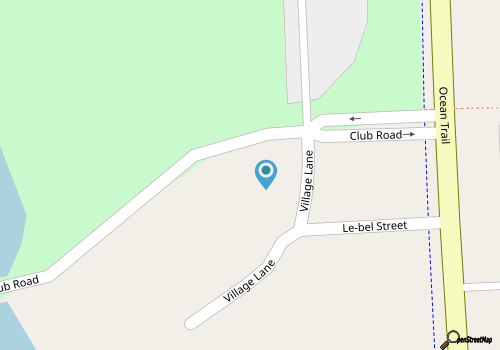 Historic Corolla Park is on the soundside of the highway, off of Club Road and Village Lane. What is there to do at Historic Corolla Park? Historic Corolla Park is a popular site for a wide range of outdoor activities, including picnicking, walking / hiking / biking, watersports, fishing, and crabbing. The park also hosts a number of events throughout the year, and especially in the summer months. How big is Historic Corolla Park? The Historic Corolla Park is 39 acres in area. Is there an admission fee to visit Historic Corolla Park? There is no fee to visit and enjoy Historic Corolla Park. There is a fee to tour the adjacent Whalehead Club, and there may be a fee to hold a special event, (like a wedding), on the grounds of the Whalehead Club site. Can you picnic at Historic Corolla Park? 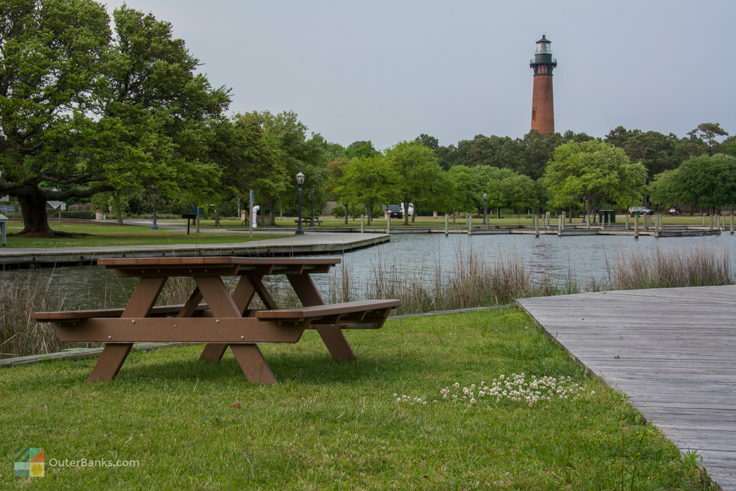 Picnicking is always welcome at the Historic Corolla Park. The park has several picnic tables, as well as a collection of big oak trees that provide plenty of shade. What are the attractions at Historic Corolla Park? The Historic Corolla Park borders the Whalehead Club and is less than a five minute walk from the Outer Banks Center for Wildlife Education, and the Currituck Beach Lighthouse. Can you kiteboard or windsurf at Historic Corolla Park? 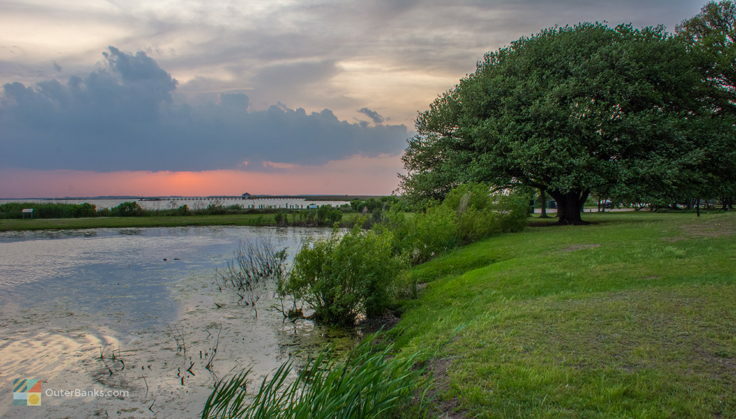 The Historic Corolla Park has plenty of greenspace bordering the Currituck Sound for rigging and readying watersports gear. It also has a small boat ramp and several natural launching areas. Can you kayak at Historic Corolla Park? Historic Corolla Park has a small boat ramp that is ideal for kayaks, canoes, stand-up paddle boards, and other small vessels. From this launch site, paddlers will be instantly connected with miles of Currituck Sound waters. Can you fish at Historic Corolla Park? Fishing is allowed at Historic Corolla Park, and the area is a popular destination for both soundside fishing and crabbing. A NC Saltwater Fishing License is required to fish in any coastal waters along the Outer Banks. What are the special events at Historic Corolla Park? 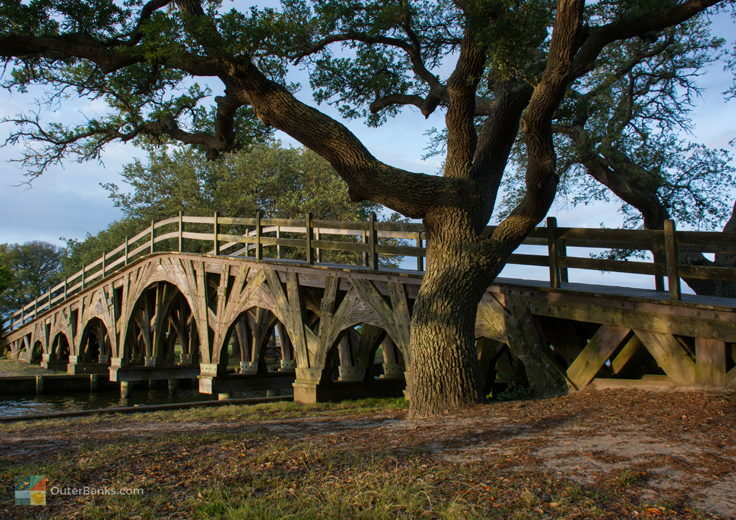 Historic Corolla Park hosts a wide range of special events throughout the year, including an annual Under the Oaks Art Festival in June, and a 4th of July Celebration with fireworks over the Currituck Sound. In addition, during the summer months, the park hosts an array of weekly events such as arts and craft shows, wine tastings, and live music. When is there live music at Historic Corolla Park? The Historic Corolla Park typically has live music one night every week in the summer months. In addition, the park hosts a number of other regular events, such as weekly wine and beer tastings, corn hole tournaments, and / or art shows. Are there hiking or biking trails at Historic Corolla Park? There are a series of sturdy trails that are ideal for biking or walking through the park. These trails also connect with other points of interest, such as the Outer Banks Center for Wildlife Education, and the Currituck Beach Lighthouse. Where can you stay near Historic Corolla Park? There are a number of vacation rentals in the town of Corolla, which include everything from smaller condos to 10 bedroom or more vacation homes. The town also has a variety of hotels and resorts that are close to the Historic Corolla Park. Is Historic Corolla Park close to the beach? Historic Corolla Park is approximately ½ mile away from the oceanfront. Is Historic Corolla Park close to the sound? 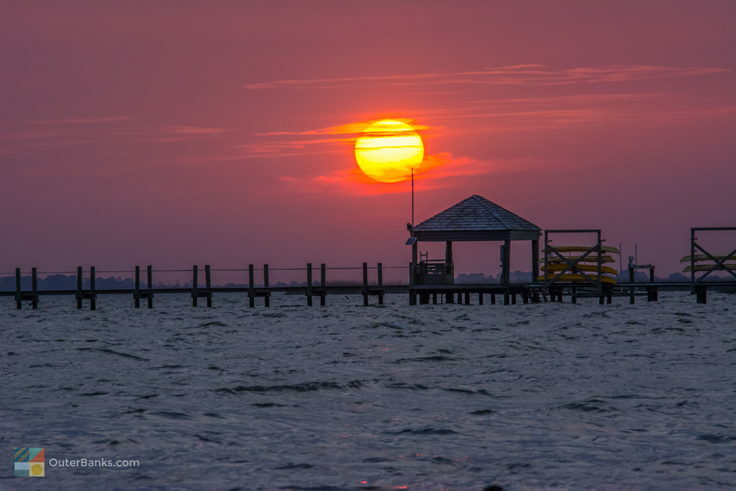 Historic Corolla Park hugs the borders of the Currituck Sound, which is why it is a popular destination for watersports, fishing, birdwatching, and other on-the-water activities. Can you have a wedding or special event at Historic Corolla Park? Weddings and special events are allowed at the Historic Corolla Park, although advanced planning is required. Generally, event orchestrators will want to contact the Whalehead Club, which manages the grounds surrounding the historic and iconic 1920s structure. Can you catch a sunset at Historic Corolla Park? 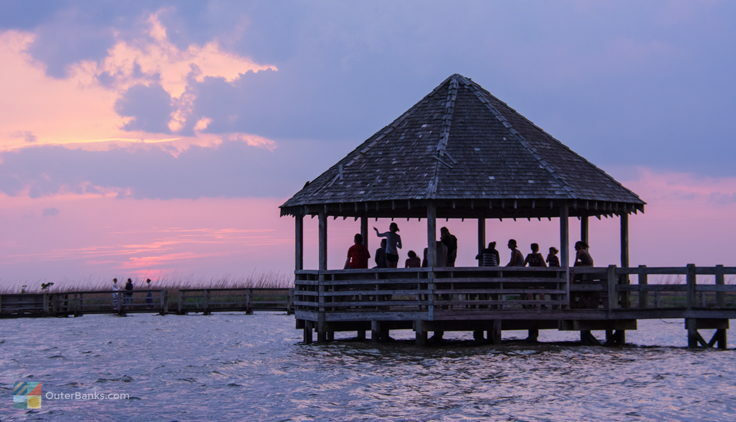 The Historic Corolla Park is one of the most popular spots in Corolla to catch a sunset, thanks to its ample greenspaces, picnic tables, waterfront gazebo, and miles of waterfront views. Visitors are welcome to bring along beach chairs, picnic blankets, and picnic baskets to enhance the show. Sun Fish Grill is a great stop for fresh local seafood and a variety of delicious specialties. The menu has a good balance whether desiring sea fare, vegetarian choices, chicken or steak for lunch and dinner. You can make up a meal with appetizers, soups and salads or order wraps, rolls, burgers, baskets, plates and platters. Enjoy traditional mussels with a wine and garlic sauce, crab bites, Ahi tuna and wings for starters. Dive into Lobster Bisque, award-winning New England Clam Chowder and a variety of salads including the Summer Fruit and Veggie salad that features mangos, blueberries, strawberries, asparagus, zucchini, yellow squash and baby spinach topped with avocados. Wraps and rolls include lobster, crab, tuna, chicken and veggie choices. Choose from chef specialties: fresh tuna, New York Strip, pasta dishes, Chicken Florentine, classic crabcakes and our signature nachos. Our Fisherman’s Platter, a house specialty includes fresh fish of the day, shrimp, oysters, and scallops.